What better way to manage coffee table clutter that with a table that doubles up as a paper shredder? Created by industrial design studio Pigeontail, the Papervore is hungry for all you printed leftovers. Measuring 16″h x 31″w x 16″d and constructed from aluminum, mahogany, oak and acrylic with a distinct mod aesthetic, the Papervore can easily munch up any correspondence with just a turn of the crank. And of course, once you’ve filled up the base container, off to the recycling bin it goes. Click ahead for an adorable video of this clever creation in action! Hmm does it actually shred entire magazines at once? I noticed the cute video doesn't show it actually going through a whole magazine. I'm guessing you'll have to tear out and shred a few pages at a time; kinda tedious. 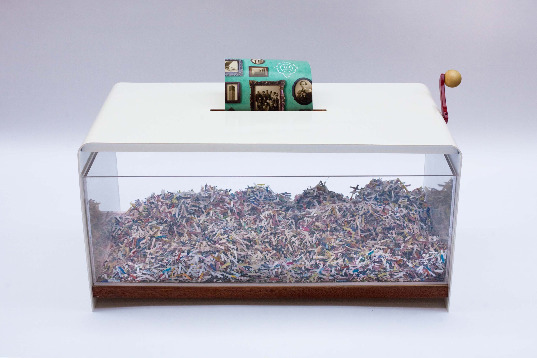 What better way to manage coffee table clutter that with a table that doubles up as a paper shredder? Created by industrial design studio Pigeontail, the Papervore is hungry for all you printed leftovers. Measuring 16"h x 31"w x 16"d and constructed from aluminum, mahogany, oak and acrylic with a distinct mod aesthetic, the Papervore can easily munch up any correspondence with just a turn of the crank. And of course, once you've filled up the base container, off to the recycling bin it goes. Click ahead for an adorable video of this clever creation in action!